Please refer to our stock # 617 when inquiring. The litho picture show you an lovely birdcage and if you open the lid you can find inside near an very cute all bisque doll also her clothing and an pretty small gild metal birdcage ..... so like it was show you on the picture !! The 7, 5 " ( 20 cm ) all bisque Mignonette is an very nice early all bisque child in generally excellent condition and made for French market by Simon & Halbig ( Germany ) . 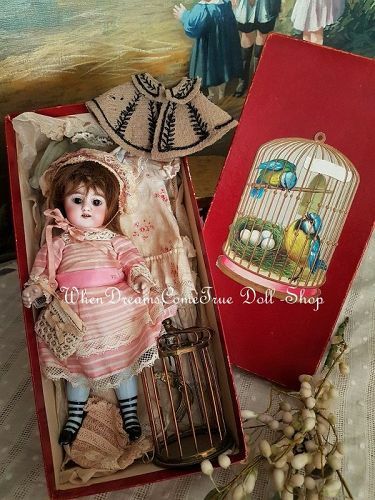 The early all bisque dolly has cute face expression with lovely painting , pale bisque socket head with pretty blue glass sleep eyes , fine painted lashes and feathered brows. Small open mouth with tiny row of porcelain teeth at her accented lips and she has lovely dimpled chin. Un pierced ears and brunette mohair wig over cork pate . The pretty doll has her original pale bisque five piece body with plump modeling , peg-jointed bisque arms and legs with rare modeled black five strap heeled shoes with tiny bow at front and painted rare light blue ribbed stocking . Has fine modeling of tiny fingers !! Her complete condition is generally excellent ... all free of damage , hairline , or repair ...... note only a very small chip at one of her hips and she has an missing finger tip at her left thumb.....please see all on my pictures !! Head mark only with .... S & H Made in Germany for France circa 1885 . Wearing all original pink and cream striped silk dress with muslin bonnet , set of under garment and little bag with described little note paper (( perhaps from her little owner at 19th. century )) !! She is preserved in her presentation box like Etrennes included another set of under garment , an extra cotton dress with bonnet and hand embroidered cape and her original chemise ( has condition at is ) with muslin bonnet. As special piece included and very nice gild metal little birdcage with metal bird ..... matching to the litho picture at lid front of the box. What a lovely piece to enjoy ..... and please let me know if you have any question and thank you very much for your interest on my Doll Shop . Layaway are always welcome , please ask me about ....thank you ! !